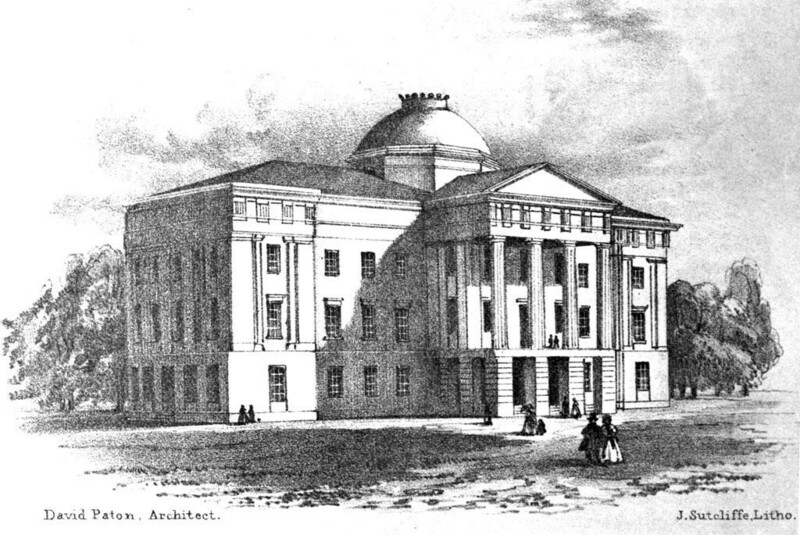 The General Assembly of 1832-1833 ordered that a new Capitol be built as an enlarged version of the old State House--that is, a cross-shaped building featuring a central, domed rotunda. The Commissioners for Rebuilding the Capitol first employed William Nichols, Jr. to help prepare building plans. In August 1833, Nichols was replaced by the distinguished New York architectural firm of Ithiel Town and Alexander Jackson Davis. Its principals modified and greatly improved the earlier design, essentially giving the Capitol its present appearance and plan. David Paton (1801-1882), an Edinburgh-born architect, was hired in September 1834 to supervise the Capitol's construction. Paton replaced Town and Davis as the Commissioners' architect in early 1835. Except for the exterior stone walls, which were largely in place when he arrived in Raleigh, the Capitol was completed entirely under Paton's watch. He made several modifications to Town and Davis' plans for the interior. He is responsible for the cantilevered or overhanging gallery on the second floor of the rotunda, the groined masonry vaulting of the first floor offices and corridor ceilings (making the first floor virtually fireproof), and the interior arrangements of the east and west wings. Most of the architectural details--mouldings, ornamental plasterwork, and the honeysuckle crown atop the dome--were carefully patterned after features of ancient Greek temples. The exterior columns are Doric style and modeled after those of the Parthenon. The House of Representatives chamber follows the semi-circular plan of a Greek theater and its architectural ornament is in the Corinthian style of the Tower of Winds. The Senate chamber is decorated in the Ionic style of the Erectheum. The only nonclassical areas in the building are two third floor rooms and their vestibules, which were finished in the Gothic style. The desks and chairs were made by Raleigh cabinetmaker William Thompson. In plan, the Capitol is a cross shape, centering on a domed rotunda where the wings join. It is 160 feet from north to south, 140 feet from east to west (including the porticoes), and stands 97-1/2 feet from the rotunda floor to the crown atop the dome. The exterior walls are built of gneiss, a form of granite. The stone was quarried in southeastern Raleigh and hauled to the site on the horse-drawn Experimental Railroad, North Carolina's first railway. Enslaved labor was used in throughout the Capitol’s construction. Local slaveholders rented their enslaved people to the project. Though we don’t know much about the specifics of their work, we do know some about the individuals who worked here. One figure we do know - Friday Jones - was born into slavery in Wake County, and was one of the men who helped to construct the Capitol. In his autobiography, he noted he was here, “working for the Government of North Carolina.” After the Civil War, he worked in the Capitol as a night watchman. He left Raleigh in his early seventies and moved to Washington, D.C., to work at the U.S. Capitol and to publish his autobiography. Completed in 1840 at a total cost of $532,682.34, the Capitol cost more than three times the yearly general income of the state at that time. The Capitol housed all of North Carolina's state government until 1888, and the Supreme Court and State Library moved into a separate building in 1888.